Oh, boy, do we have fun in store today! Links To Resources: Mad Monster Activity, Monster Songs and Poems, have kids draw their own monsters or make them out of whatever craft materials you have to hand! Before we get to the fun part (announcing the winner of the Valentines Day Writing Contest!) just a little business about Perfect Picture Books. – This is PPBs 14th week. – There are 245 books on the list before today’s go up. – They fall across 145 categories/subjects/themes. – With possibly one exception, every single one posted has resources! So thank you all for your fantastic work. We are building a great resource here for parents, teachers, home schoolers, writers, and gift-givers! That said, I think we have enough of a list going now that we should all be talking this up to everyone we know who might find the resource useful – it’s only really great if people are actually benefitting from it. So I encourage you all to spread the word in whatever capacity you can. Tracy (known to many of you as A2ZMommy) is writing a review about it for her local news site today! You can read it HERE. 1. Please check the list on the Perfect Picture Book tab before you choose a book to post. I try hard to keep it updated. If I’m behind, it’s usually only by the previous week’s list, so check that too. We are trying to avoid multiple postings of the same book. 2. When you add your link to the list, please add the post-specific link (not the general link to your blog.) It doesn’t matter that much for the actual day of posting, but for anyone who comes along afterwards, your link then links to whatever the next post you did was – not the PPB. And for me going along updating, I then have to search for the post and get the right link for the archive page. 3. Please only post favorite books WITH RESOURCES! The resources are what set our list apart from many others. The resources can be links online or things you make up, but there must be something that people can use to expand their use of the book. Books without resources will NOT be added to the master list. 4. Please follow the PPB format (available at the bottom of the Perfect Picture Book tab) as closely as possible. This allows for consistency across blogs, making it easy for people using the list to find the information they want. 5. Please make sure to post themes, age appropriateness, and fiction or non-fiction clearly. It’s a lot of work updating the list, and if I have not read the book, I can’t guess where it’s supposed to fit or how to archive it. NOW. AT LAST. THE MOMENT YOU’VE ALL BEEN WAITING FOR!!! Who won the Valentine Contest? Oh, wait. I think I hear my doorbell. I’ll be right back…. Once again, I’d like to thank everyone for their terrific entries. Many of us readers are writers. We know how hard it is to put your work out there. And we appreciate your bravery. All the entries were worthy and fun to read, and I wish you could all win! Congratulations, Penny! This is the second time you have won a contest here. You may have a future as a writer 🙂 You get your pick of Ann Whitford Paul’s book, or a picture book ms critique from me. Let me know via email what your choice is! Thanks again to everyone for making the contest such a success! Now have a great weekend, and PPB bloggers, please remember to add you post-specific link to the list below, which I will hopefully remember to attach this week! 🙂 OH! And remember our awesome interview which will take place on Sunday with Donna Farrell, website and blog designer for children’s authors and illustrators! Big congratulations to the winners! A valentine involving Frankenstein is so creative, it's no wonder it took the prize! It's a good one! I think you'd like it 🙂 As an artist, Peter is interesting. He used to do a much more time consuming detailed method, but his publishers wanted faster work so he experimented with some different things and came up with this whole new style which is different but still very appealing, I think. 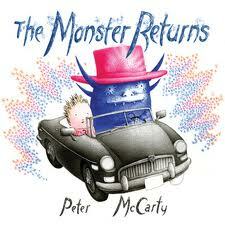 Yes, I think Peter could do a whole bunch of Jeremy/Monster books…! And the PPBF stats are coming along! Congrats to all the winners. All the stories were so wonderful. I loved reading each and every one. This picture book selection sounds so adorable. Congratulations to Penny, Erik and Vivian, well deserved. (I thought I had posted here…mmmm) Love the book review Susanna, although I am not one for monsters, this one looks too cute….. didn't know that was possible…lol! It really is very well done. If you haven't read it, I think you;ll like it – and the first one too! Thanks for you kind words about PPBF – I really appreciate them! 🙂 and everyone who world so hard to contribute and make it what it is!